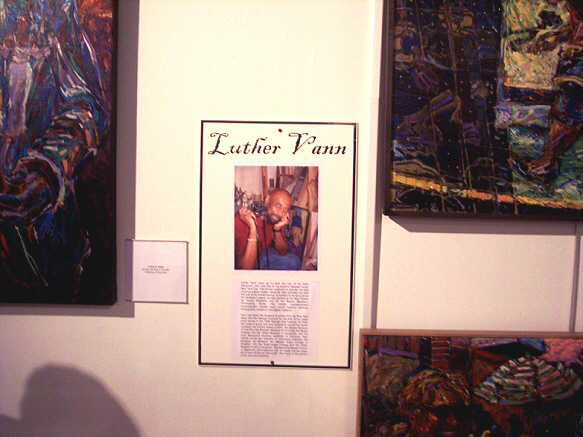 If we accept the description of painting as a form of language, then it should be said that Luther E. Vann began composing ELEMENTAL, the Power of Illuminated Love with the oldest images in the book, which date back to 1970 and 1972. My pen started the process of catching up with his brush strokes in 1991, when I attended an exhibit of his work at the Beach Institute in Savannah, Georgia, and almost immediately started scribbling descriptions of the images that seemed to glow, shout, and sing at me from the canvases. A little later, a chance encounter with the artist himself led to discussions about the possibility of creating a book together, one in which my writings-poetry and essays-would strive to articulate the essence of the paintings. Visually, Luther’s work already spoke very powerfully for itself and I had doubts about being able to match in words what he so masterfully had already accomplished with painting and sculpture. How would I even begin such a formidable task? The idea of such a book itself went all the way back to Bohemian Paris, if not further, when artists such as Pablo Picasso and Marc Chagall joined in creative partnerships with poets like Guillaume Apollinaire and Blaise Cendrars. Who was I to fail to live up to such a noble tradition without at least giving it all the best shots I could muster? I started by first borrowing small prints of the artist’s work and studying them. It would be a mistake, I knew, to simply describe the images. So I meditated instead on the creative and spiritual energies that inspired the artist himself and led to the works’ composition. Then I took the pressure off myself by writing only when struck by an impulse to do so as opposed to sitting in front of a blank page and trying to force a flow of words that were not there. With that point settled, the poems then seemed to arrive of their own accord, dropping out of the night sky like message-bearing meteor showers or greeting me with entire stanzas as I woke up in the morning. Creative work has a way of unfolding in one dimension of time while everyday life progresses in another. My fateful beginning on ELEMENTAL evolved into a journey that took all of some seventeen years. While ELEMENTAL continued to grow and mature at its own pace, my first three books were completed and published. Periodicals on a national level, like ESSENCE Magazine, as well as those on more regional levels, like the Savannah Literary Journal, began to publish poems from the work in progress. Likewise, Vann continued to produce award-winning paintings which eventually made their way into the book as well. …This is, after all, the same city that gave the world such stellar talents as poet Conrad Aiken, rapper and actor Big Boi, photographer Jack Leigh, author James Alan McPherson, lyricist Johnny Mercer, author Flannery O’Connor, actress Diana Scarwid, and many other gifted men and women. At a time when war and various forms of violent discontent are so much a part of our daily consciousness, I believe it crucial to engage creative alternatives. This is not to say that ELEMENTAL is nothing more than an aesthetic indulgence to appease the sensibilities of two artists. It is in a fact a work that speaks very much to the heart and soul of our times: to the need for global political agendas that anchor humanity in peace rather than ensure its demise with war; and to the power of individuals to persist in exercising love in a world where people no longer seem certain of love’s meaning or value. We are as grateful as we are honored for the support being provided. We hope that in time the book comes to represent more than just the achievement of one creative team, but a collective contribution towards the triumph of art and a spirit of community devoted to [celebrations of] life over the chaos and intolerance that so often ends in life’s tragic destruction. Demonstrating their ability to make meaningful practical contributions to the world community, some thirty artists donated works to the Artists for Haiti fundraising exhibit, which opened March 7, 2010, and will run until March 21 at the Indigo Sky Gallery, located at 915 Waters Avenue in Savannah, Georgia. Participating artists set the prices for their works with 100 percent of the proceeds slated to go to relief organizations working to assist the victims of the massive earthquake that struck Haiti in January. The community’s positive response to the event became quickly evident as red dots indicating a sale began to appear next to various works. The idea for the event, said Meadows, came from Vaughnette Goode-Walker, the Telfair Museum of Art director of cultural diversity and author of the forthcoming book, Going Home. Artists responding to the call included such veteran talents as Suzanne Jackson, Imke Lass, and Luther E. Vann, as well as emerging artists like Phil Starks and Savannah College of Art and Design (SCAD) student Michelle Raab. Originally from Ghana, William Kwamena-poh maintains a studio in Savannah’s famous downtown City Market Artist’s Colony and is among the popular artists in the Southeast. He described Haiti as “a second or first cousin to whom one automatically responds if you see them endangered. “If something happens to one, you go over there and say what can I do for you? What can I do to help? So donating to this cause was a natural thing. I didn’t have to think about it. Specifically, Kwamena-poh donated two brilliantly-rendered paintings entitled Market Place and Voting Rights. Both of these works, he said, reflect his understanding of life in Haiti. “When we look at most of the work in Haiti, it is mostly images of women in a market place, or women in action, women producing and going to the market. Or things that are communal in nature, reflecting a community identity. That’s why for me contributing to this exhibit was a natural thing to do, but I wanted something colorful, that reflected what Haiti’s all about.